The spatial integration of irregular temperature data (CRUTEM4) using spherical triangulation removes any coverage bias. 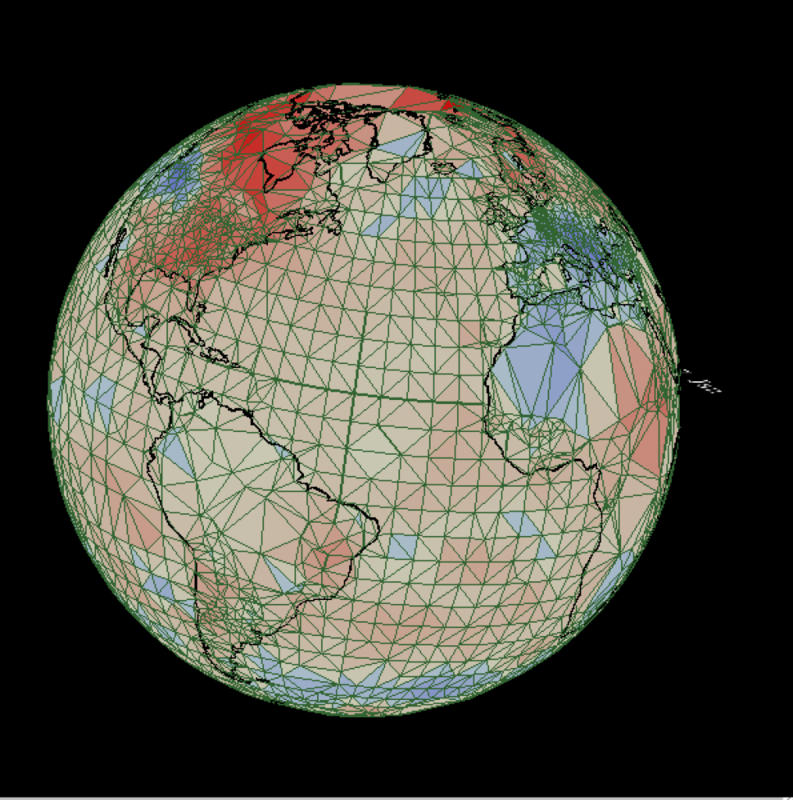 I have made a spherical triangulation of the CRUTEM4 station data combined with HSST3 ocean temperature data. This is essentially Hadcrut4.5, but instead of using a (lat,lon) grid, it is averaged over the surface of a sphere including the poles. So how does this compare to existing temperature data? The next plot shows the annual global temperature anomaly as compared to the standard Hadcrut4 values and those of Cowtan & Way. The spherical results are essentially identical to those of Cowtan and Way! They use a complex 2D kriging algorithm to interpolate the 5 degree T(lat,lon) values into higher latitudes, partly guided by UAH satellite data. This result demonstrates that spatial integration of irregular temperature data (CRUTEM4) using 3D spherical triangulation alone removes any coverage bias. Thanks to Tim Osborne for providing IDL code that processes CRUTEM4 station data. This entry was posted in AGW, Climate Change, climate science, Institiutions, Science, UK Met Office and tagged Hadcrut4. Bookmark the permalink. I think this shows very nicely that interpolating fully is more important than exactly how you do it. I think C&W’s kriging is overkill (though quite OK), especially when the result is to be reduced to a single integral, and your method is just what is needed. When Cowtan and Way came out in 2013, I tried here a very primitive infilling with latitude rather than hemisphere values. That got about halfway there. The mesh interpolation is obviously much better. 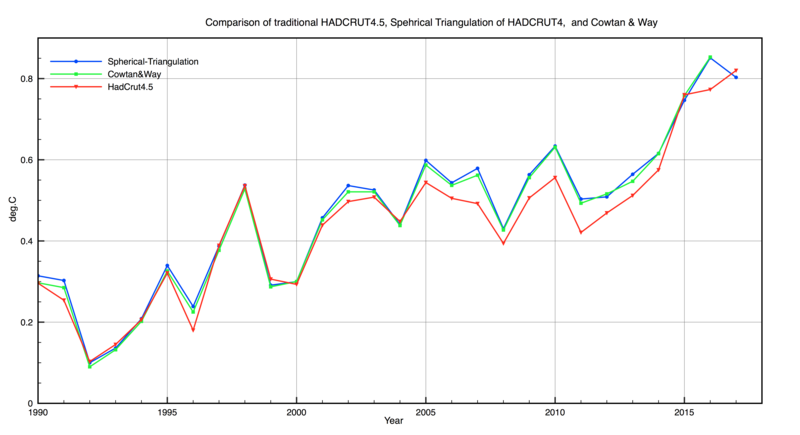 The underlying data is exactly the same as used by Hadcrut4.5, no more and no less. The only difference is how you integrate it. Covering the earth’s surface solves the problem. Almost spot on C&W. Minor differences can be caused by the fact that C&W don’t use the HadCRUT ensemble median for kriging, they krige all 100 ensemble members and then take the median of that. As I recall, Kevin Cowtan once told that it took about 24 hours to run all ensemble members, including short hybrid versions, and that this thorough procedure could yield slightly different results compared to using the HadCRUT median directly. However, I should not call it overkill, since the ensemble also provide uncertainty intervals. You could also spherical triangulation on the 100 ensemble members. It would take about 2 hours on a Mac pro for all 168 years. Now that you’ve come up with a better method for determining the global average temperature, you should have a crack at analysing the data for sea level rise and see if you can find a better way to cope with the partial record of land based tide gauges that themselves are moving up/down. North America is still recovering from being compressed under the weight of the Laurentide Ice Sheet. This one ice sheet contained about 60% more ice than that under current Antarctica. After the Laurentide & Eurasia ice sheets melted after the last ice age, sea levels rose by 120m. Some of the observed rise is still a remnant of that. I am wondering if there is not some indirect way of measuring net sea level rise relative to land. Maybe yearly average Length of day , or global averaged salinity ? Using tidal gauges is problematic. The rate of change of sea level is important. Coral islands will rise with sea level and always have done, if not too rapid. If we stopped destroying the coral it might help.